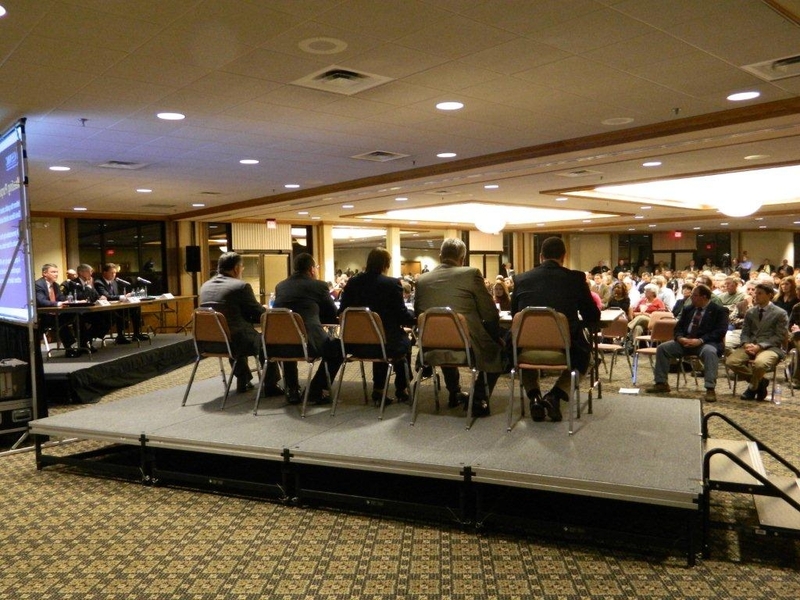 NRC officials take questions during the latest Davis-Besse public meeting. Openness and transparency aren’t just catchy watchwords at the NRC. They are the way the agency operates. For three and a half hours Jan. 5 the agency took questions from the public at a standing-room-only meeting the agency organized in Port Clinton, Ohio. The meeting was held to discuss the appearance of small cracks inside the concrete of the shield building around the reactor at the Davis-Besse plant nearby on the shore of Lake Erie. At the session, both the NRC and the plant’s owners, FirstEnergy Corp., talked about the discovery of the cracks during work to cut a hole in the building, and the NRC’s subsequent conclusion that the building remained capable of performing its safety function. NRC officials told the crowd that inspecting a nuclear plant is a process that is never finished because the agency’s full-time, on-site inspectors are constantly inspecting the plant. And, if at any point they saw something of concern the agency would take the necessary steps, including a ordering a shutdown, to maintain safety and protect people and the environment. Some 300 people — about 50 standing in the back and along the sides of an Ohio National Guard meeting hall — gathered for the 6:30 p.m. meeting, which ran a half hour past the scheduled 9:30 conclusion. The NRC let the meeting run long to ensure all questions posed by the audience and those listening by telephone were answered. Some of those who came to the microphone had detailed questions for both the NRC and FirstEnergy. Others made what amounted to speeches, some against nuclear energy, others in support of the plant. The meeting even drew a few people with “Occupy Toledo” on their jackets. Two members of Congress and several local elected officials also attended. After an hour of explanation about the cracks from FirstEnergy and the NRC’s presentation on its independent safety review of the situation, they praised the NRC. Rep. Marcy Kaptur, D-Ohio, whose district includes the plant, noted her previous criticism of the agency over Davis-Besse, where the reactor head was found to be severely eroded in 2002, but added, “We believe the NRC has been doing a much better job of oversight at the facility.” She said the agency was “taking it to the public” with the informational session. Openness and transparency aren’t just catchy words at the NRC. They are the way the agency operates.